How thin do you need your lines to be? Do you need them consistent as well? Are the conventional technical pens just not thin enough for you? Then you may want to try out the Le Pen technical pen in a mind-bogglingly small 003 tip. 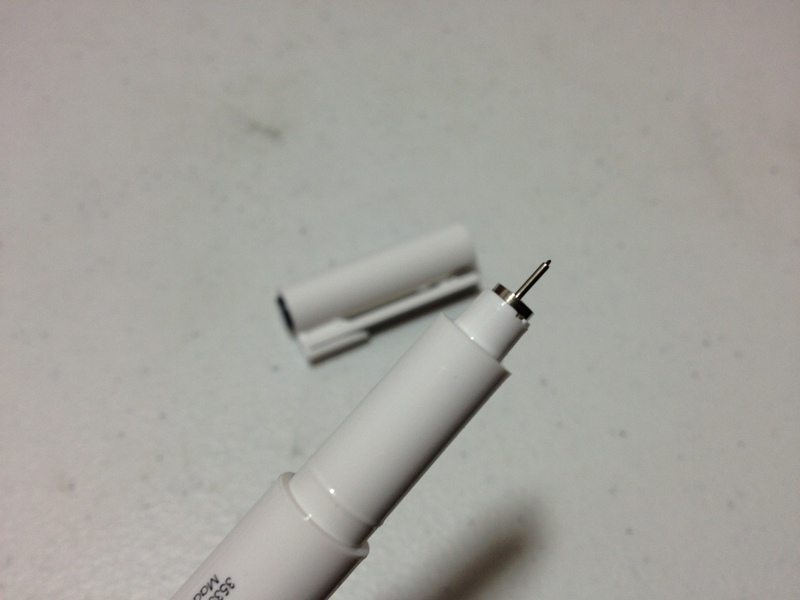 The body of the pen is white. All necessary information is printed in several languages on the side in black, it is raised which makes me thing it will rub off with a lot of use, but this hasn’t happened yet. It also has the size on top for easy reference during storage. The clip is a very flexible plastic covered with a metal strip, making it durable and flexible at the same time, though it is quite strange and bulky. The cap lines up flush with the body and almost flush with the end when it is posted. The body proper is flat, and slightly tapered to the front, with some grip from the raised writing. It is a bit fat which makes it uncomfortable for smaller hands or for long periods of time. The grip and point though are almost identical in size to the Micron. The nib however is very small, it feels entirely destroyable every time it is placed on paper. The ink is as resilient as micron ink. And I would say as black but the size of the nib makes it seem much grayer so I can’t tell. I almost think I’m writing with a pencil sometimes. Though because of it’s size the line isn’t the most consistent in the world, but it is the most consistent at this size. It does write incredibly smooth and remarkably comfortable for a short period of time. So overall this is a great pen. It writes smooth, puts down ink well, and is one of the few pens you can get in this size. It is slightly less comfortable than a Micron in my opinion, and I would be tempted to say the ink is not as good. But it’s still a great value and a handy pen for some of those more detailed lines. 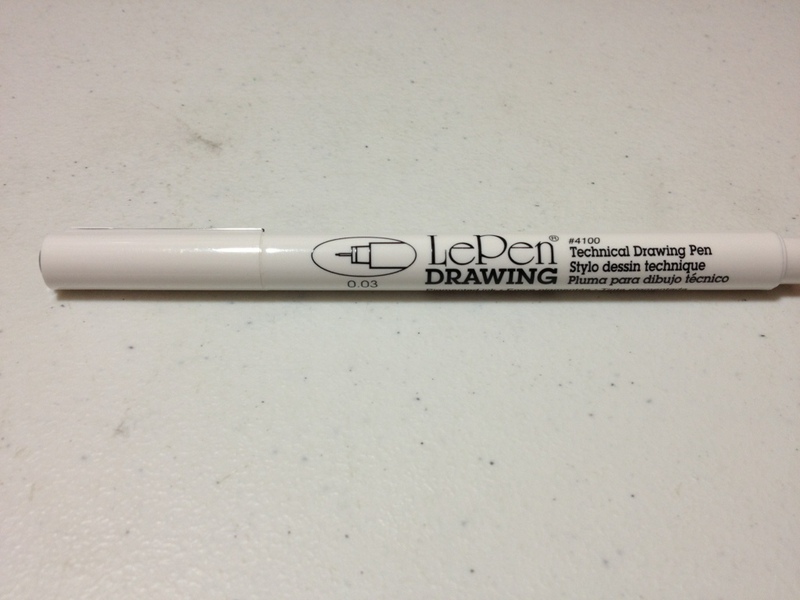 This entry was posted in Advanced Supplies, Utensils and tagged 003, le, le pen, pen, review, technical, technical pen, white by Dragon Co (Austin Smith). Bookmark the permalink.